Learning spelling word lists can be tedious and time consuming for your child. How can you make it more fun? Are certain lists easier to learn than others? Keep reading to see what you can do to help your child learn their spellings with ease. 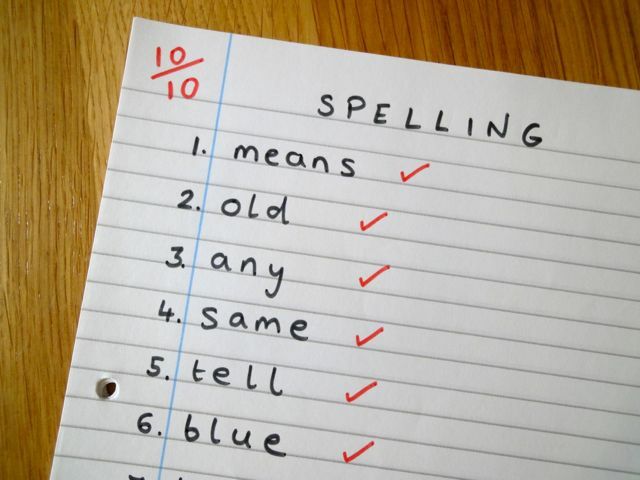 Some spelling lists are subject-related, containing words that children are likely to come across in their studies. Others are lists of high frequency words, such as the dolch word list or lists of words commonly used by children in their writing. While it is undoubtably important that your child is able to spell these words correctly, some children may find them difficult to learn, since there is no common spelling pattern linking the words. One solution is to play spelling games with your child to help them learn the words on these types of spelling word lists. Other groupings are also possible such as homophones, contraction words or compound words. Try these spelling lists which combine many of the above groupings and organise them by year group. I am a fan of the Word Study approach, which encourages children to study groups of words which share similar spelling patterns. Your child becomes a 'word detective' as they try to make sense of word patterns and subsequently build up their word knowledge. Spelling word lists which are grouped by vowel sound or consonant sound particularly lend themselves to the Word Study approach. Also, since my son often makes errors in the spelling of vowel sounds in particular, I decided to create a series of spelling word lists grouped by vowel sound. 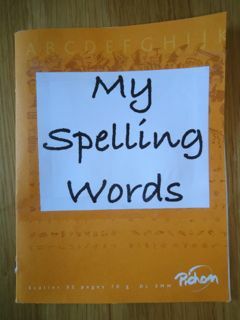 Below I explain how I created these spelling word lists and how they can be used to play a fun game. The first step was to choose a list of words. I used this spelling vocabulary list on the Reading Rockets website which contains 850 common words that account for 80 percent of the words children use in their writing. The list is grouped by grade level so I mainly used the words from Grades 1 to 3 (ages 6 to 9). We have, in fact, already used this word list before in the Spelling Words Booklet which my son uses while he is writing to check word spellings. Having chosen the spelling words to practice, I grouped all these words by vowel sound, and then created sub-groups of the different spelling variations associated with each sound. For example, I first identified all the words in the spelling list with the /ai/ sound. Then I grouped these words according to the four basic spelling variations of the /ai/ sound: 'ai' as in nail and rain; 'a' as in table and paper; 'a-e' as in cake and made; and 'ay' as is play and stay. Three words were on the list with different spelling variations for the /ai/ sound: great, eight and they. These three I grouped together in an 'oddball' category. After the /ai/ sound, I moved on to other sounds such as /ee/ , /igh/ , /oa/ , /u/ etc. 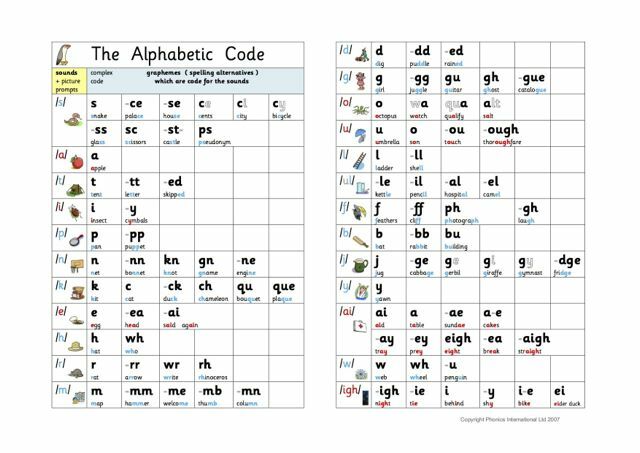 An excellent summary of the phonic sounds with their different spelling alternatives can be found in The Alphabetic Code Chart from Phonics International. I used this chart to guide me in creating the sound-focused spelling word lists. You can read more about phonic sounds here. Below you can find the spelling word lists which I created by vowel sound. These are based on an English accent and so there may be differences with other regional accents. I did not include words with the short vowel sounds /a/ as in 'flag' or /i/ as in 'bring' because there are not many commonly used spelling variations for these vowel sounds and so they are easy words to spell. I also left out some of the longer multi-syllable words with two or more vowel sounds, such as 'something', 'never' or 'behind', where it might be confusing which vowel sound we were using. Finally, if I couldn't find enough words for a particular category in the list of 850 common words, I added others not included on the list, drawing on these resources for spelling word lists. /ai/ as in rain. Spelling variations a, a-e, ai, ay. /ee/ as in been. Spelling variations e, ea, ee. /igh/ as in fight. Spelling variations i, i-e, igh, y. /oa/ as in boat. Spelling variations o, o-e, oa, ow. /u/ as in jump. Spelling variations o, u. /o/ as in from. Spelling variations o, a. /e/ as in send. Spelling variations a, ai, e, ea. /or/ as in short. Spelling variations a, or, al, aw, oor, ore, our. /ar/ as in start. Spelling variations a, ar. /oo/ as in good. Spelling variations oo, oul, u. /oo/ as in moon. Spelling variations oo, o, ou, ew, ue, u-e.
/ou/ as in found. Spelling variations ou, ow. /er/ as in were. Spelling variations er, ir, ur, ear, or. /oi/ as in point. Spelling variations oi, oy. /air/ as in hair. Spelling variations air, are, ear, ere. /eer/ as in deer. Spelling variations ear, ere, eer, ier. /yoo/ as in few. Spelling variations u-e, ew, u, -ue. First choose which vowel sound you want to practice and print off the relevant Word Cards using the links above. Cut out the Word Cards and then ask your child to sort them under the appropriate header (printed in red). Those which don't fit under a specific column should be placed under the 'oddball' category. In this way your child familiarises themselves with the different spelling variations for this vowel sound, and which words are spelt with which variation. You can check they have sorted the cards correctly by referring to the relevant Overview file, found by clicking on the links above. Now your child is ready to play! Try this Spelling Word Board Game which you can play with a regular Snakes and Ladders game board or print out a specially prepared board. Before each move, read out a Word Card to your child. If they identify the correct spelling for the vowel sound in the word by waving the correct mini-banner, they move forward the number of places shown on the dice. If they are wrong, they move back the number of places shown on the dice. Your child will also have fun playing this Spelling Word Bingo Game. Choose a Word Card from the box and read it out. Ask your child to find a square on the bingo board which contains the correct spelling variation for that word. If they are correct, they write the word in the square. If they are wrong, the Word Card goes back in the box. Mr Thorne's Spellbook iphone and ipad app. Contains 101 spelling tests based on vowel and consonant sounds. Score 10 out of 10 to unlock the safe and obtain the treasure. Word Sorts for within Word Pattern Spellers provides fifty word sorts to practice vowel and consonant sounds.